Dimensions: approx 1.06" x 1.0"
These handy adapters allow you to quickly and easily mount a USB Type B Female connector onto a breadboard or perfboard circuit. Each pin is brought out to the 5-pin single-row header on the bottom of the board; the single-row header can easily be inserted into a breadboard. This design allows the adapter to be placed on the edge of a breadboard, keeping cables and connections out of the middle of the breadboard where you are working. The pins are arranged in numerical order and each is clearly labeled with its USB pin number. 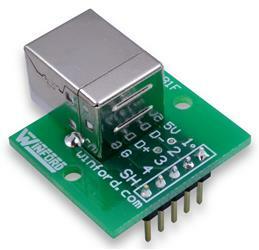 These adapters are particularly useful for breadboarding USB microcontroller circuits. Our experience so far shows that these adapters can be used with USB 2.0 High Speed signals without introducing any problems. However, please be aware that these adapters are not USB 2.0 High Speed certified. Note that these adapters are NOT active USB devices that give you digital I/O pins. These are passive devices that simply make it easy to bring all the USB signal wires into your breadboard/perfboard circuit.